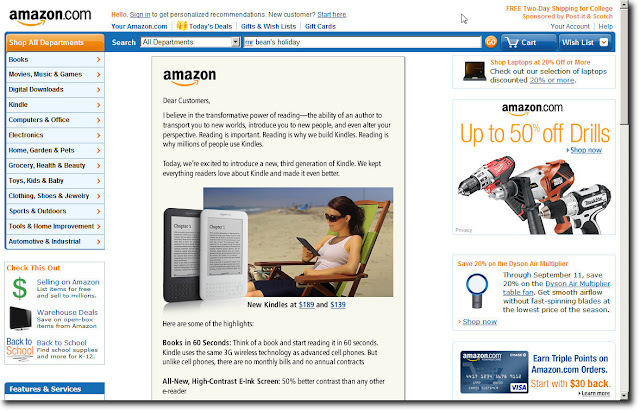 Amazon.com announced a new version of Kindle, its e-book reading product, in July 2010. Within a few days of its announcement, the cheapest version - the 6" Wi-Fi version - sold out. It has since remained sold out, with the expected date of shipping of new orders staying a couple of weeks beyond. At $139 this is $10 cheaper than the cheapest ebook reader from Barnes & Noble - nook. The Wi-Fi version of nook costs $149, while the one with 3G connectivity is $199. The corresponding Kindle versions are $10 cheaper. At least some analysts expect the price to drop to $99. 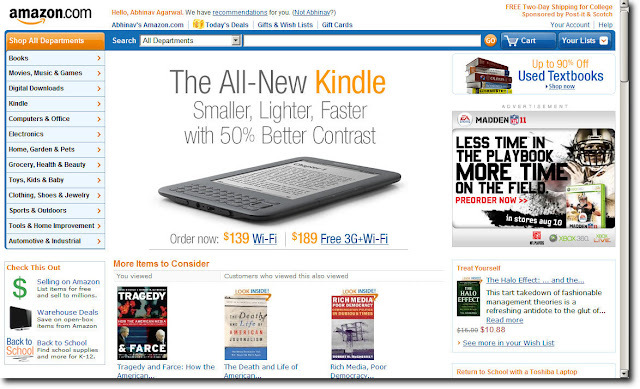 Then there are some who expect Amazon to introduce color to the Kindle. Some expect the Kindle to evolve into a more general-purpose tablet-like device, to compete more effectively with the Apple iPad. Some expect the Kindle to retain its niche. And at least some expect the Kindle to not survive. Any which way you look at it, the competition is doing wonders for the customer, and for book readers. See my other posts related to the Kindle.